Louise Branam, 101, Holton, died Saturday, Nov. 29, 2014, at Midland Hospice House in Topeka. She was born Aug. 13, 1913, in Atchison, the daughter of William C. and Jennie Saggs Ashcraft. Mrs. Branam was a farmwife. 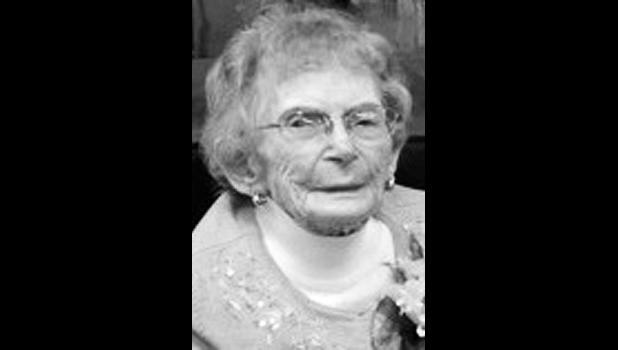 She was a lifetime member of Jackson County Historical Society, Larkinburg Christian Church and a member of Heart of Jackson Hu­mane Society. She married Truman R. Branam on Oct. 28, 1935, in Oskaloosa. He died Jan. 9, 1991. She also was preceded in death by a son, Monty Branam, in 1964; a grand­daughter, Kadi Branam, in 1997; a brother, Raymond Ashcraft; and two sisters, Rosemary Meagher and Virginia Stukenberg. Survivors include a daughter, Judy Bledsoe and husband Victor, Mayetta; a son, Jay Branam and wife Rogette, Holton; three grand­children, Lesley Harris and hus­band Dan, Jennifer Swindale and husband Kevin and Brett Branam; six great-grandchildren, Morgan Thompson and husband Jarrod, Caitlyn and Scott Cashier and Blake, Tyler and Garrett Harris; and two great-great-granddaugh­ters, Anberlyn and Emmaley Thompson. Funeral services will be held at 11 a.m. Wednesday at Mercer Fu­neral Home in Holton. Burial will follow in Denison Cemetery. Fam­ily will greet friends one hour prior to services, beginning at 10 a.m. Wednesday. Memorial contributions may be made to Larkinburg Christian Church, Heart of Jackson Humane Society or Jackson County Histori­cal Society, sent in care of Mercer Funeral Home, P.O. Box 270, Holton, KS 66436.